Providing enhanced and critical care at the scene of emergencies by our fully qualified and equipped VOLUNTEER doctors. ... the doctors you see providing treatment on the roadside, in fields and on sports pitches alongside South Western Ambulance Service crews and air ambulance services across Wiltshire, Swindon and Bristol. 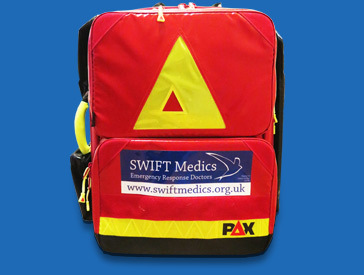 SWIFT Medics is a registered charity and an affiliate of BASICS - the British Association for Immediate Care. ... critical care at the scene, by our fully qualified and appropriately equipped doctors. As well as our highly qualified volunteer doctors we have experienced paramedics and nurses in our team. Yet there is no NHS funding for this type of care. Our short video explains who we are and why we need your support in fundraising to recruit, train and equip our volunteer doctors. We rely wholly on public donations, receiving no funding from the NHS - so your support is vital. 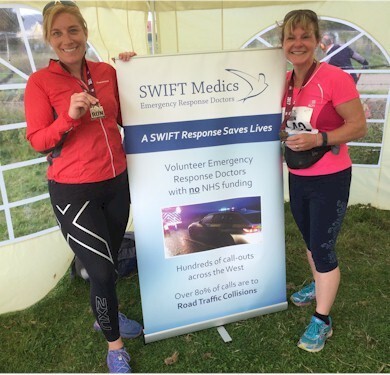 on Sunday 23 September raising a great total of £220 for SWIFT Medics.